The authors created this manual particularly for beginning instructors at the post-secondary level who have never had formal teacher training. They not only present the essentials of effective instruction that incorporates technology, but in doing so, review key principles and practices that have been shown to enhance students' motivation to learn. The manual is a distillation of core information derived from both the authors’ own professional experience and the body of literature on teaching effectiveness, learning motivation, and the infusion of technology in post-secondary settings. They draw on their respective educational and research backgrounds that range from the elementary through to the college and university levels. 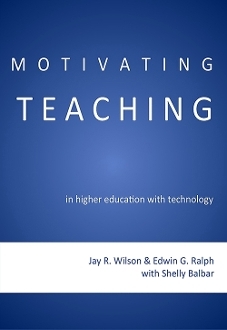 In Chapter 1 the authors answer the question: "What are the best principles/practices of effective teaching/learning and learner motivation that are applicable to undergraduate education?" They provide key definitions, explain foundational assumptions, and present a conceptual framework for the book. In Chapter 2 the authors describe a key component undergirding all motivational instruction: the establishment and maintenance of a positive and productive teaching/learning climate. They also analyze the process of effective classroom management, in terms of the teacher’s prior planning and actual implementation of wisely selected instructional procedures and technologies. They also offer strategies and suggestions to deal with interpersonal problems and conflicts that may arise in the teaching/learning process. In Chapter 3, the heart of the manual, the authors describe practical components of effective instruction, from both the planning and the implementation aspects. They present specific motivational strategies and possible technologies for conducting both teacher- and learner-centered activities both in f2f and online settings. In Chapter 4 they authors distill key insights they derived from their own educational backgrounds and the related literature regarding critical aspects of motivating the teaching/learning process in adult education. They further provide several examples of technologies that have proven effective in these situations. In Chapter 5 the authors offer further details to consider when seeking to infuse technologies within the entire teaching/learning process. They conclude the book with insights they have learned regarding the role of technology in post-secondary learning. Dr. Jay Wilson is an associate professor in the Curriculum Studies Department as the University of Saskatchewan. He has extensive practical experience in the areas of technology and instruction and has been honoured with a number of teaching awards for his efforts. He has worked to raise the profile of teaching in higher education. His program of research centres on authentic learning, design studio learning, and technology skill development in educators.